I was addicted to energy drinks. If I didn't have one every morning I would fall asleep at the wheel. I started taking this Vitamin D to improve my immune system and aside from not getting one single cold this season I also don't feel drowsy anymore. I've kicked the energy drink habit! 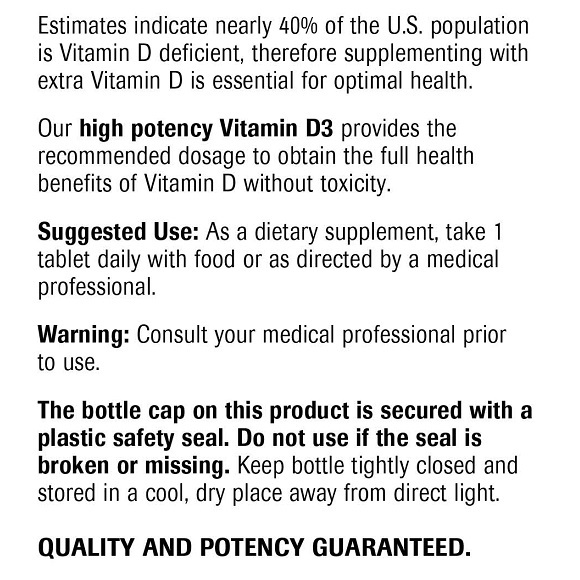 Doctors recommended 5,000 IU of vitamin D for optimal health. At 5,000 IU, roughly 95% of the population will get the full health benefits of vitamin D.
Vitamin D comes in two forms, vitamin D2 and vitamin D3. 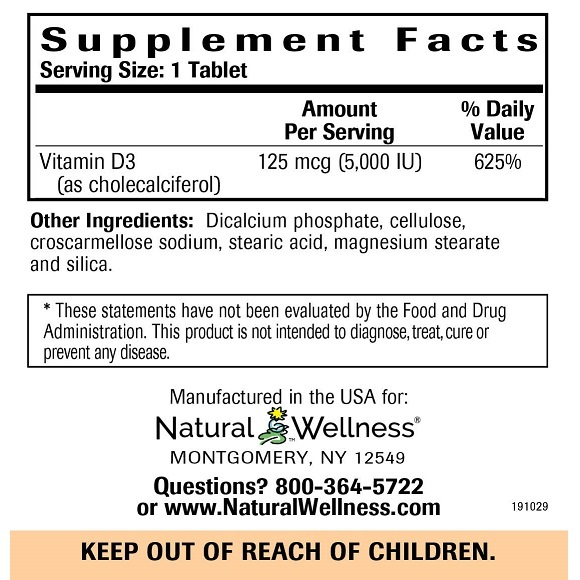 We offer vitamin D3, the natural, more effective form of vitamin D, also known as cholecalciferol. 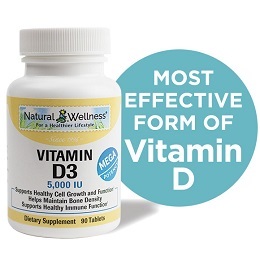 Vitamin D3 is more easily absorbed and more potent then D2 because it is chemically indistinguishable from the form of vitamin D produced in our bodies and is more effectively converted to calcitriol, the active form of vitamin D used by our bodies. Vitamin D3 is more stable on the shelf compared to D2, and is more likely to remain active for a longer period of time and when exposed to different conditions (temperature, humidity, and storage). 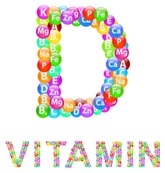 Vitamin D3 has been shown more effective at raising and maintaining vitamin D in blood tests. 75% of U.S. teens and adults are deficient in vitamin D. This number will continue to rise as we spend less time outside, use more sunscreen and our population continues to diversify. Your exposure to sunlight is limited. If you experience less than 10-30 minutes of sun exposure between 10 a.m. and 3 p.m. at least twice a week. You wear sunscreen on a regular basis. When correctly applied, sunscreen reduces your ability to absorb vitamin D by more than 90 percent. You have dark skin. The pigment melanin reduces the skin's ability to make vitamin D in response to sunlight exposure. Your kidneys cannot convert vitamin D to its active form. As people age, their kidneys are less able to convert vitamin D to its active form. You are overweight. Vitamin D is extracted from the blood by fat cells, altering its release into the circulation. People with a body mass index of 30 or greater often have low blood levels of vitamin D.
The body manufactures vitamin D from cholesterol, through a process triggered by the action of sunlight on skin, hence its nickname, “the sunshine vitamin.” However, not all sunlight is created equal: The sun’s ultraviolet B (UVB) rays, the rays that trigger the skin to produce vitamin D, are stronger near the equator and weaker at higher latitudes. So in the fall and winter, people who live at higher latitudes (in the northern U.S. and Europe, for example) can’t make much if any vitamin D from the sun. Vitamin D is essential for calcium and phosphorus absorption and utilization. Calcium and phosphorus are essential minerals found in the bone, blood and soft tissue of the body and have a role in numerous body functions. Phosphorus levels can affect calcium levels in the body, and vice versa. Stimulates osteoblast (bone producing cell) activity which helps maintain bone density and strength. Stimulates the synthesis of osteocalcin, an important protein involved in bone formation. Helps maintain adequate blood calcium levels which help support cellular metabolic processes, cardiovascular and neuromuscular/neurological function. Vitamin D is important for normal, healthy cell growth and function. 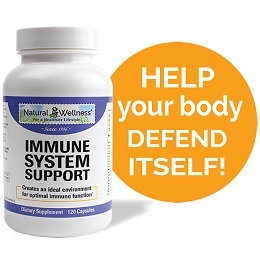 Vitamin D helps support healthy immune function. Scientists have found that vitamin D is crucial to activating our immune defenses and that without sufficient intake of the vitamin, T cells will not be able to react to and fight off serious infections in the body. The research team found that T cells first search for vitamin D in order to activate and if they cannot find enough of it will not complete the activation process. In addition to overall health, vitamin D plays an integral role in skin protection and rejuvenation. 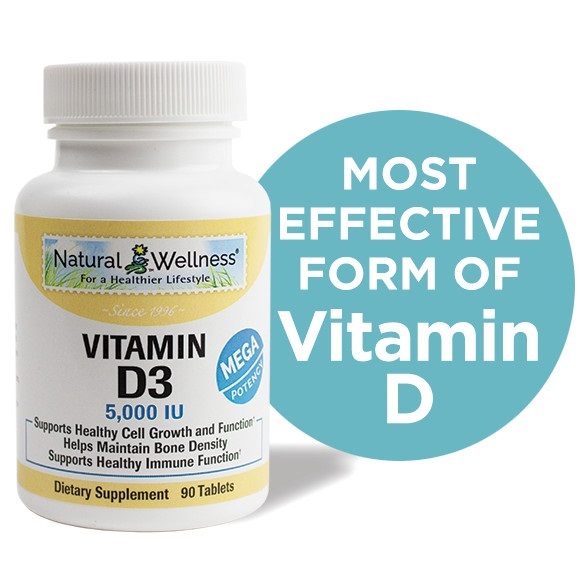 Vitamin D contributes to skin cell growth, repair, and metabolism. 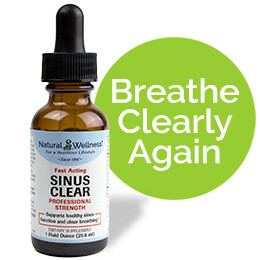 It optimizes the skin’s immune system and helps destroy free radicals that can cause premature aging. 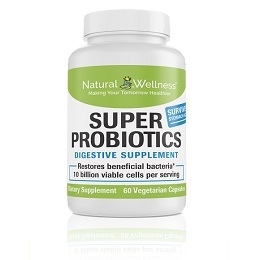 Helps support normal, healthy insulin secretion and manage blood sugar levels. 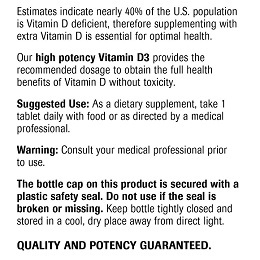 Each bottle of Vitamin D3 contains 90 Tablets. As a dietary supplement, take 1 tablet daily with food or as directed by your medical professional. Vitamin D3 5,000 IU is MANUFACTURED in the USA to meet FDA strict current Good Manufacturing Practice regulations (cGMP).